P and J by Design. 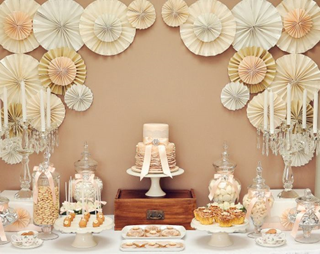 They have used a very pretty arrangement of paper fans in their elegant dessert table design below, which also includes chic crystal candelabras. Don’t forget be inspired don’t copy. I’ve found a tutorial on paper fans for you. http://catchmyparty.com/blog/diy-how-to-make-a-backdrop-out-of-paper-rosettes so go on have a go !! !